When the town of Hillsborough was laid out in 1754 where the Indian Trading Path crossed the Eno River, the surrounding area was being rapidly settled. Since 1748, Lord Granville’s land office had been doing a booming business. Many of the settlers were Scotch-Irish Presbyterians. In 1755 missionaries to the area organized Hawfields, Eno, Red House, and Griers. By 1765, Henry Patillo was the minister for Hawfields, Eno, Little River, and New Hope. Other churches in the area were Cross Roads (1792) and Hillsborough (1816). The Presbyterians who attended these churches and the ministers who preached there were deeply involved in the great events that took place in this region. The churches were barely organized when the Regulator Movement began in 1764 with public protests against corrupt local officials and appeals to the provincial government to stop the abuses. Little was done, however, and when the unrest threatened to become an armed uprising, Governor Tryon marched with troops to Hillsborough and Salisbury. At this time the four Presbyterian ministers in the area – Hugh McAden, James Creswell, Henry Patillo, and David Caldwell – wrote to “the Presbyterian Inhabitants of North Carolina,” urging them not to take part in the insurrection but to be cheerfully obedient to Law and Government. If any had sworn not to pay their taxes, it was an illegal oath and they need not be bound by it. They also wrote to Gov. Tryon, hoping he would find “a very small proportion” of Presbyterians among the insurgents. [If that were true, would they have written the letter?] That uprising was quelled peacefully, but unrest continued to the point of physical attacks on members of the corrupt “Courthouse rings,” including the despised Edmund Fanning of Hillsborough. To protect a special session of the court in Hillsborough, Tryon called up the militia and marched upcountry. Met by armed Regulators west of Hillsborough, Tryon refused to confer, and the battle ensued. Some of the Regulators were captured and hanged in Hillsborough, and we will see where they are buried. At the Alamance Battleground we will learn more about these events. The American Revolution brought General Cornwallis through Hillsborough in 1781. Later that same year, Loyalists seized 200 patriots in Hillsborough, including the North Carolina governor! 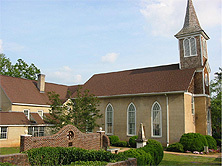 The first of the two NC conventions to ratify the US Constitution took place on the site of the Hillsborough Presbyterian Church. The town of Hillsborough still has many homes and public buildings from the colonial and revolutionary period. On Friday afternoon we will have a tour of the central part of town, with a guide from the Visitor’s Center. It is not a large area to cover on foot, but if you prefer to travel by car, you can do so. One of the true highlights of our tour will be the visit to Burwell School in Hillsborough. Presbyterians were famously dedicated to a high standard of education for the training of ministers. But why did they offer a superb classical education to girls? The Burwell School opened in 1837 and taught young ladies reading, writing, arithmetic, and French, Latin, Greek, musical instruments, voice, and etiquette. The school was operated by Rev. and Mrs. Robert Burwell during his pastorate at the Hillsborough Presbyterian Church. Rev. Burwell later served as president of both Peace College and Queens College. We will also hear the fascinating story of how Elizabeth Keckly, a teenage slave girl in the Burwell household, became a confidante of Mary Todd Lincoln during the Civil War. Saturday’s visit to the New Hope church (est. 1756) will remind us of the great interest among Presbyterians in the establishment of a university. Many of the founders and most of the first faculty members were Presbyterian, and some of New Hope’s pastors also taught at UNC. On Friday evening, Dr. George Troxler of Elon University will address the third great movement of those times -- the Second Great Awakening, also known as the Great Revival. Why did it first appear in NC at the Crossroads and Hawfields Presbyterian churches in Alamance County? How did the emotional camp meetings affect the local churches? Were all of them involved in the movement? How did it spread so quickly across the state? On Saturday we will visit both Hawfields and Cross Roads. Many Presbyterians in North Carolina today have roots that go back to these early piedmont churches. These are just some of the questions we will be addressing during our tour in Orange and Alamance counties, April 13-14. This is the first time that our annual two-day tour is taking place in the Spring. We hope you will be there to enjoy the spring flowers with us! The registration form for the tour is on the last page of this newsletter. Maps are on p. 4. Because parking is a problem around the church on a weekday, registration for the meeting will be at the Microtel Inn from 11:45 to 12:30. If you can come earlier, please join the officers about 11:00 for an early lunch at the nearby Mayflower Seafood Restaurant. The Microtel Inn at Hillsborough is new and has offered us an excellent price for overnight (see p. 3). But if you decide to go home Friday night, you can meet us the next morning at New Hope church at 8:25 a.m. It is on NC 86, east of I-40 (see p. 4). We will not have a bus this time but hope to carpool as much as possible, both to save gas and to enjoy each other’s company! If you can come early or stay longer, you can visit Ayr Mount, 376 St. Mary's Rd, Hillsborough, the restored 1815 plantation home of William Kirkland. Guided tours Thurs.-Sat. at 11 a.m. and 2 p.m., $10. Poet’s Walk is a mile-long trail through meadows and woodlands, following the Eno River parallel to the Old Indian Trading Path, passing ruins of an old tavern. Open to all daily in April from 9-6. Downtown Hillsborough has many antique, craft, and specialty shops, as well as locally owned restaurants. The Daniel Boone Village on South Churton St. includes nearly 30 antique shops, a blacksmith shop, and other businesses. You can also visit the Commandant's House of the former Hillsborough Military Academy on Barracks Road, and see the old textile mills and mill villages of West Hillsborough. 11:00 Optional early Dutch Lunch at Mayflower Seafood Restaurant, near Microtel. All travel on this tour will be by private auto. Detailed maps will be provided! 1:00 Talk on Burwell School, tour, and display of artifacts and pictures. 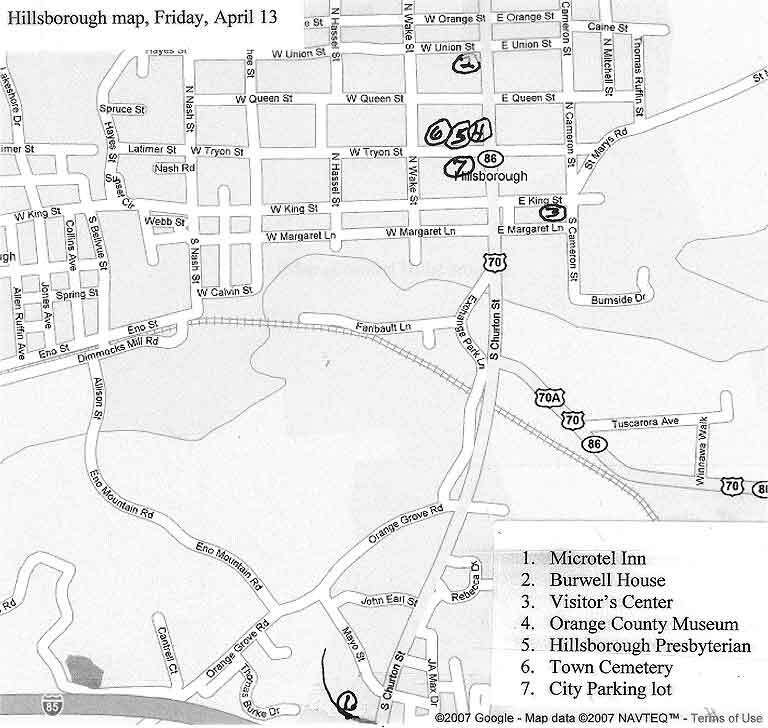 2:45 Guided tour of Hillsborough, on foot or by car, starting at Visitors Center, 150 E. King St.
**For events in or near the church, parking is available in City parking lot across Tryon St. from church. 8:15 Leave in cars from Microtel for New Hope Church. 8:25 New Hope Presbyterian Church and cemeteries, 4701 NC Hwy 86, Chapel Hill. 10:00 Alamance Battleground Visitor’s Center and the Allen House, 5803 S. NC Hwy 62, Burlington. 11:35 Hawfields Presbyterian Church and cemetery, 2115 S. NC Hwy 119, Mebane. 1:00 Crossroads Presbyterian Church, 3302 N. NC 119, Mebane. 1:30 Return to Hillsborough or depart for home. Suggested accommodations: Microtel Inn, 120 Old Dogwood St., Hillsborough, NC. 919-245-3102. Rates for NCPHS only, and only until Apr. 3rd: $39.95 + tax (1 double bed); $49.95 + tax (two doubles). Directions: From I-85, take Exit 164 to go north on S. Churton St. Take immediate first left, between AutoZone and Pizza Hut. Microtel is up the hill behind Pizza Hut. From: I-40, take Exit 261 to go north on Old NC 86 for 1.6 miles. As soon as you pass under I-85, take first left as above. The roads that Microtel and the Mayflower Restaurant are on are too new to be on Mapquest. 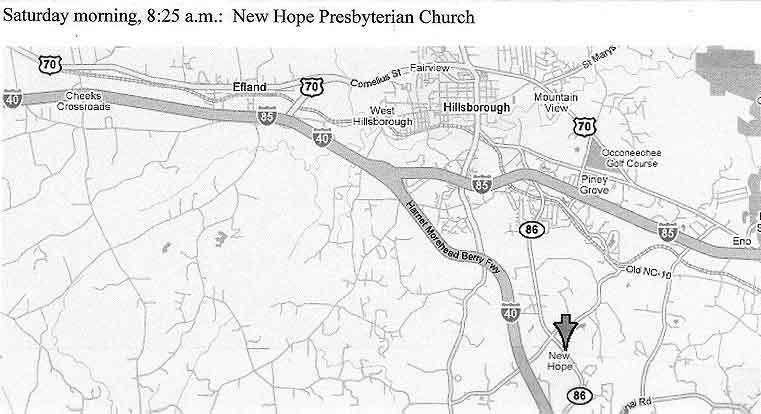 In order to make the Hillsborough and New Hope Church maps more readable online, we have provided links to larger versions of those maps. As this newsletter is going out, we are preparing for our first-ever tour of historic churches and sites in Northern Ireland. This year is the 100th anniversary of the Presbyterian Historical Society of Ireland, and they invited NCPHS to bring a group over to join them for that event. We will be their guests for dinner at Union Theological College on the campus of Queens University, and Dr. Robert Cain of our society will give a brief talk on historical connections between Presbyterians in Ireland and in NC. The tour we have planned will emphasize the history of those Scottish Presbyterians who settled in the North of Ireland, and the roots of those who later left for America. It will include introductory visits to some libraries and archives, visits to several historic Presbyterian or Reformed churches as well as sites relating to St. Patrick, and excursions to Carrickfergus, the Giant’s Causeway, Londonderry, and Armagh. Our trip is being co-sponsored by New Hope Presbytery, which has been linked with the Presbytery of East Belfast since 1990. Rev. Jim Campbell, who was very involved in setting up that relationship, is making all the local arrangements. We will be staying in the homes of church members in that presbytery. Although we had talked about such a tour for some time, the opportunity came up fairly quickly. It required a lot of planning in a short time, and much of the publicity did not go out until after Christmas. Many people who contacted us were unable to go on short notice and hoped we would plan another trip to Northern Ireland soon. We don’t know if that is feasible, but it is something we should talk about. And how about inviting a group from Northern Ireland to stay with some of us in NC and go on one of our tours? Society’s Peace-ful Day Last Fall! On October 14, 2006, our society had a delightful meeting at Peace College. We were warmly welcomed by President Laura Bingham, and her husband Warren Bingham then gave us a very interesting account of the history of the college. William and Joseph Peace of Oxford, NC, gave money and land for the school, which opened in 1872. The first female president of the college was Mary Graham, a suffragette. In the 1950s President William Presley worked with the First Presbyterian Church of Raleigh to keep Peace College from being merged into St. Andrews. In 1994 Peace became a four-year college, one of the few remaining woman’s colleges in the country. After lunch in the college dining hall, President Don Saunders opened our business session. First on the agenda was the passage of a number of revisions to our by-laws, in order to reverse the traditional times of our meetings. The Executive Committee proposed having our tours in the spring in order to avoid the sometimes drenching rains of the hurricane season. The membership approved the change. Our one-day Annual Meeting will now be on the second Saturday of October, and our two-day tour of historic churches will be on the weekend after Easter. Our society’s former president, Rev. Thomas Spence, gave a report on the decision at the General Assembly in June to close the Historical Foundation at Montreat. Tom is on the Board of Directors of the Friends of the Historical Foundation at Montreat. Reports by officers followed, and the business meeting was adjourned. Before leaving, however, the group was treated to an excellent tour of the college, led by Mrs. Rebecca Leggett, Director of Visitor Services. We were especially glad that our long-time member and former president, Gov. Bob Scott, was able to drive down from Haw River to attend the meeting. On March 16th our former president, Martha MacLeod, will receive the Flora MacDonald Award at the Scottish Heritage Symposium. See the next newsletter for more details! Last November one of our long-time members, Rev. Ben Lacy Rose, died at the age of 91 at the Westminster-Canterbury retirement home in Richmond, VA. He was a Presbyterian pastor for nearly 70 years, and his churches included Chinquapin, Bethel, and Beulaville in Duplin County, NC; Central Presbyterian Church in Bristol, VA; First Presbyterian Church in Wilmington, NC; and Little Chapel on the Boardwalk in Wrightsville Beach. Dr Rose earned his B.D., Th.M, and Th.D. from Union Seminary in Virginia and served on the faculty as professor of pastoral leadership and homiletics from 1956-1973. He was a chaplain in the U.S. Army during World War II and was awarded the Bronze Star and the Legion of Merit He retired from the U.S. Army Reserve in 1974 with the rank of colonel. I retirement he continued to serve as a supply pastor and gave frequent talks and lectures. Another member, John Teunis Vergeer of Pittsboro, died last October at the age of 78. A native of Grand Rapids, MI, he was a graduate of Hope College in Ann Arbor, MI. He had served in the US Army and had been Vice President of Continental Bank in Chicago. He was a member of University Presbyterian Church in Chapel Hill. Our sincere sympathies go out to his wife, Rev. Melicent Huneycutt-Vergeer of Pittsboro. Although not a member, Joe McLean of West Raleigh Presbyterian Church often attended NCPHS meetings. We are sorry to report his death on Feb. 16. NCPHS presents awards each year for outstanding books or other projects on church history. If you would like to nominate a book or a project for this year’s award, please let Ann Myhre know right away. Her address is on this page. Our society's award-winning books and others that have been donated are in the Scottish Heritage Center at St. Andrews Presbyterian College in Laurinburg. The center at St. Andrews also displays on a rotating basis our society’s collection of dinner plates commemorating historic Presbyterian churches. With permission of the late Dr. Harold J. Dudley, the society is reprinting a speech he first gave in 1964 entitled “Toryism in North Carolina.” If you are interested in those who remained loyal to the British Crown during the American Revolution and if you would like a copy, please send $2.00 to Sally MacLeod Owens. Finally, we still have a few copies of Foote’s Sketches, edited by Harold J. Dudley, for $15 each. To buy one, please contact either Sally Owens or Barbara Cain. Contact information is on the previous page. The society’s year begins the first of January. If the membership date on your mailing label is earlier than 2007, please pay your current dues. Back dues are forgiven. Dues and any address corrections may be included with your registration for the Spring Tour or sent to Sally Owens, P.O. Box 20804, Raleigh, NC 27619-0804. The schedule, suggested accommodations, and maps are on pp. 3-4. If you need a ride to the meeting, call Earl Fitzgerald (below), who may be able to put you in touch with someone else who has registered for the meeting. Please send this form with your check (made out to NCPHS) by April 4th to Mr. Earl Fitzgerald, 2213 Foxhorn Road, Trent Woods, NC 28562. The North Carolina Presbyterian Historical Society will hold its Spring Tour in Orange and Alamance counties on the weekend after Easter, April 13-14. On Friday there will be a special tour of Burwell School in Hillsborough, a walking tour of the town, dinner at the Hillsborough Presbyterian Church, and a talk about the Second Great Awakening in the Piedmont. On Saturday the group will visit the churches of New Hope, Hawfields, and Cross Roads, as well as the Alamance Battleground. For more information, please contact John Wray, Program Chairman of NCPHS, at (919) 782-3384 or 787-9754 or Brenda Spence, NCPHS Secretary, at (919) 498-2159.